On 24 and 25 April 2015 family entrepreneurs from all over Germany met like-minded people, students and scientists for an intergenerational dialogue between theory and practice at the renowned Zeppelin University Friedrichshafen with the motto „I will be away” or “There to stay”. This year the main focus was on the “entrepreneurial spirit” and its role as far as construction, leading and handing over of a family-run company is concerned. Contributions of theory and practice were complemented in order to enable the exchange of ideas and innovations. 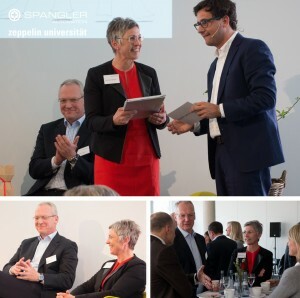 Hannelore Spangler, who has recently been honoured with the “Bavarian Staatsmedaille” for her merits and responsible corporate behaviour, emphasizes that decisions are constantly shaped by a sense of responsibility for the employees. She continues that, therefore, a constant integration of the staff at SPANLGER within the Innovation Management is not only a concession but also an appropriate future investment to prevent the effects of company blinders.